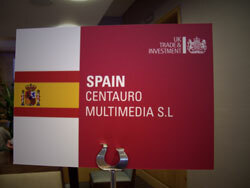 Centauro Multimedia is one of the four Spanish companies, which were selected by UK Trade & Investment to participate in their inward mission in Manchester. Centauro Multimedia, along with other prestigious companies such as Namco, Lucas Arts, Nokia or Sony Computer, has also been invited to attend the Develop Conference & Expo in Brighton. The aim of the inward mission was to introduce foreign companies to the Manchester’s Game Industry Community, which is the second largest cluster in the UK, and to visit the Develop Conference & Expo, which focuses on game contents, both for video and for mobile devices. During this event the European developer community meets to learn from each other and to share experiences, to be inspired by renowned experts and to be updated on the latest trends, development tools and technologies.